This tray has a diameter of 7 inches, a height of about 1.5 in and a Net WT. of 8 oz. These are the best! Huge, California-grown gourmet pistachios, roasted right here in our state-of-the-art facility—fresh and delicious. They are roasted in small batches to bring out their best flavor. A truly wonderful gift. Net wt. 8 oz. my only problem with my 5lb bag, is how can I eat them all while their at peak flavor. We've gotten positive feedback from our numerous nut gifts sent to our customer-friends. We ordered a box for ourselves and found them to be fresh and tasty. Our children loved the nuts. The quantity and packaging made it look chintzy for the price .They were shipped quickly which was wonderful. I sent these to my brother for his birthday and he loved them! The nuts from Superior Nut Company are always very fresh and large in size. I would highly recommend them to anyone who wants to buy nuts for themselves or to send someone. I sent these as a gift, and the recipient was VERY happy with the size and quality. ProsFree shipping was a big PLUS! 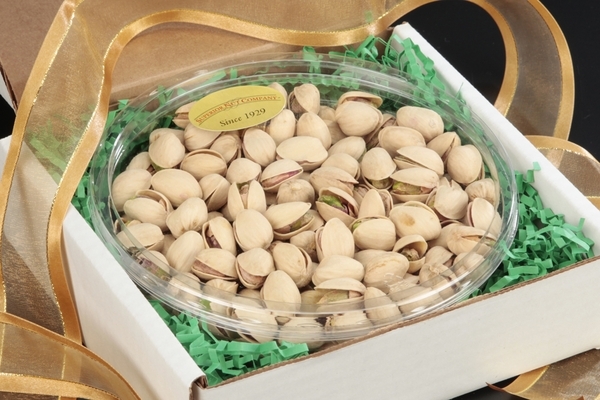 The pistachio tray was a great value with free shipping! I will order again. ConsIt is a small container. Talk about colossal pistachios, this is the real deal. It should be called the real steal. I don't think there was an empty shell in the entire bunch. Cooked to perfection, salted nicely and presented good enough for a gift. ProsTaste was out of this world. OVERPRICED FOR A PLASTIC TRAY! These pistachios were delicious and I received them in a timely manner. ProsThe pistachios were crisp and delicious. ConsI thought they were coming in a decorative tin, I would not have paid almost $17 a pound for pistachios in a plastic tray. I was very disappointed. Exceptionally good quality and quantity. Sent as a Christmas gift to my son in the Navy in Tokyo Japan. Gift arrived on time and was enjoyed. The nuts were good quality, but were very expensive. This was for an online gift. Purchase was easy and recipient said the package was as advertised. receiver of gift really liked them. price and shipping cost are very important to me. your crew is very helpful. Good quick delivery and packaged well. Also taste great. This was a birthday present and he loves pistachios so he was very pleased with it. The service from Superior Nut Store was, well superior! Many thanks. Wonderful product extremely fresh. Great customer service and fast delivery. Colasal Pistachios - Colassal hit!!!! Sent to a pistachio lover - she could not stop raving about these nuts. Will order again and again and again!!!! The interaction I had was staff was remarkable. Would recommend to anyone looking for great product, efficiency and excellence. This was so affordable and excellent quality! We were trying out the site and store for the first time with this purchase and we were VERY impressed. The package was shipped and arrived really quicky too! We will definitely be ordering this product, and others, again! They arrived and looked very festive...I cannot comment on taste as they are. Gift! My brother loves Pistachios and I send them to him for his birthday. He absolutely loves yours!!! I bought these for my father because he loves pistachios and he said they were delicious. I have purchase for Superior Nuts before and have always been very satisfied. ProsThey were very tasty and very nicely presented. The shipping was amazingly fast. These pistachios were a huge hit! I sent them to number of people who helped physically move my business from one location to another. Everyone was super impressed with size and quality. I felt that this was a nice, yet inexpensive token of appreciation. I will order this product again! Bought these as a gift for my grandfather and he absolutely LOVED them. Quick shipment and delivery! Product was fresh and easy to shuck. Quality, size, taste--this product is exceptional! I have never tasted your goodies, but my brother, age 88, now living in New Jersey, loves them, his daughter reports. She is a fan, as well. ProsThe nuts and the fruit trays have been fresh and succulent, it is reported. I bought these for Christmas, very good tast, large nuts!